Adorn your paper crafting projects with realistic, life like peony blossoms as striking as those found in ornamental gardens! 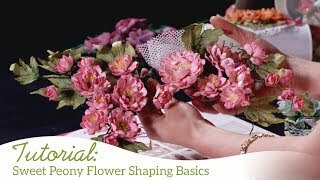 When used in combination with the coordinating cling stamp set, the Small Sweet Peony Die allows you to cut and assemble petal and foliage pieces in a multitude of configurations allowing you to create the perfectly sized peony blossom for all of your handmade cards, scrapbook layouts or altered art pieces! These dies are part of the Sweet Peony Collection and pair with the Small Sweet Peony Cling Stamp Set.This stamp and die combination has been created for use with the Floral Basics Shaping Mold as well as the Deluxe Flower Shaping Kit.